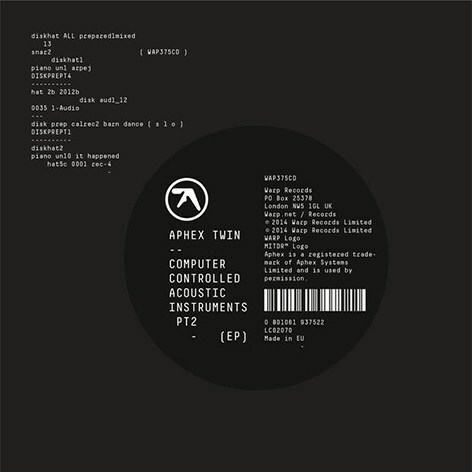 Following on from the release of the extraordinary ‘Syro’, Richard D. James offers up another release under the Aphex Twin moniker, ‘Computer Controlled Acoustic Instruments pt2′. The new releases comprises some of James’ most experimental electronic tracks, all of which cover a wide range of styles and of very varying length. The new EP seems to come across as a little bonus for those who enjoyed the release of ‘Syro’ so much, though it’s offering seems to be in a much different vein to the comeback album of last year. There’s some enjoyable elements to the EP, though this doesn’t seem to be Richard D. James at his best. ‘Computer Controlled Acoustic Instruments pt2’ seems to follow different paths to its predecessor, and instead shows us a much different slant to Richard D. James and his approach to composition. Much of the album is dominated by short tracks lasting less than a minute, each showcasing an experimental style in terms of what can be achieved through the use of computers. There’s many enjoyable elements to the EP, though it’s successes don’t seem to be achieved though one cohesively structured musical experience. At times, ‘Computer Controlled Acoustic Instruments pt2′ seems to be quite a challenge to listen through, and one that doesn’t seem to offer as much enjoyment as some of James’ previous experimental notions. There is great amount of talent here, though not as glaringly obvious as some of James’ best work. Those expecting a true follow up to last year’s ‘Syro’ might find ‘Computer Controlled Acoustic Instruments pt2’ to be a rather disappointing release. There’s some great tracks being presented by the talented artist, though it doesn’t seem to quite reach the same heights as one might be expecting. Those going into the EP with a mindset that allows for the sheer amount of experimentation being presented might find the EP to be a very enjoyable release. There’s some great ideas being presented here, and some little hints and snippets of great techniques, ones that could hopefully evolve into fully-formed tracks that will surely astound and amaze. Aphex Twin’s latest release ‘Computer Controlled Acoustic Instruments pt.2’ is out now. Experimental band K.A.N.T.N.A.G.A.N.O., featuring half of Feu Thérèse (Members Alexandre St-Onge and Jonathan Parant), and Alexander Wilson, offer up their latest release ‘Acro’. The new EP comprises three tracks, offering up an incredible blend of sonic experimental electronic music. ‘Acro’ sees the band delving deep into the experimental genre, drawing from it an odd mix of musical structures that come across incredibly well on their latest EP, providing its listeners with an unusual yet cohesive musical journey. It seems that on their latest release, the band have manged to find a lot more structure than what their previous releases suggest, though this doesn’t come with a loss of any of their experimental roots. ‘Acro’ offers up an odd little musical journey, one that is progressed forth by electronic roots. Electronic drones accompanied by the odd hint of guitar and many electronic squeaks, blips and beeps. The whole release sounds very dark for the most part, offering a somewhat unsettling musical journey as it progresses across its three different sections. Each piece is structured together very nicely, showcasing the best of each members ability in presenting experimental music. The whole release falls into a very inaccessible category, one that isn’t as warm and inviting as previous releases we’ve seen from any of these musicians. 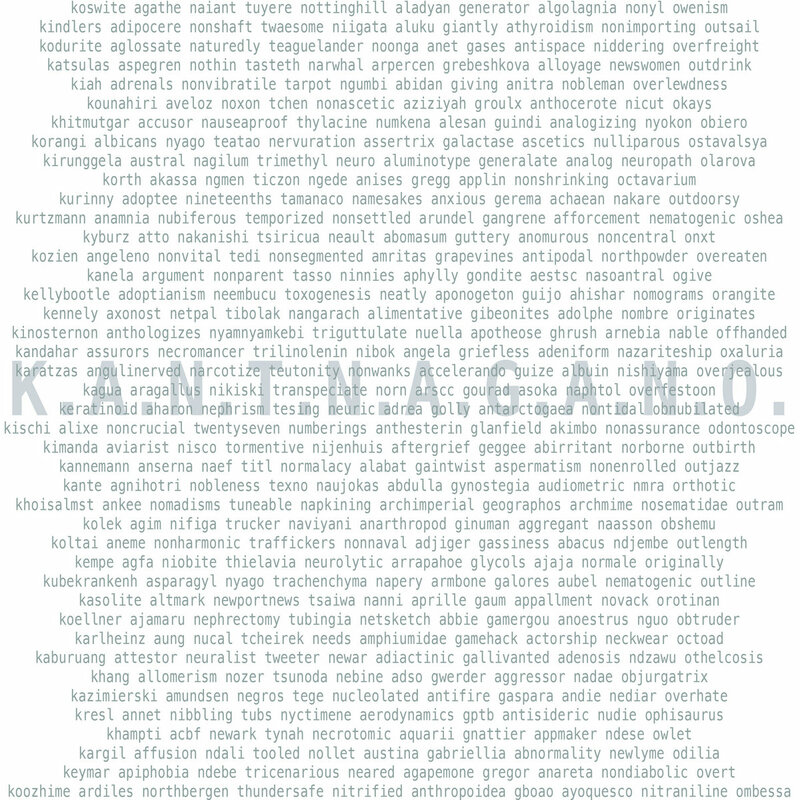 Even with its inaccessible element running throughout, there’s a clear vision being presented by K.A.N.T.N.A.G.A.N.O., who offer up some of their best music on their latest release. Those who enjoyed Constellation Records releases of Fly Pan Am and Feu Thérèse might find something equally enjoyable with K.A.N.T.N.A.G.A.N.O.’s music, who seem to offer up equal amounts of experimental music though in a much different context. It seems that on their latest release, we’re being offered some of the best of each member’s abilities, whose talents in composing such unusual music comes across in an incredibly enjoyable way on ‘Acro’. The EP serves as a perfect little taster of what this band has to offer, and hopefully is a sign of more things to come from this largely under-rated band. K.A.N.T.N.A.G.A.N.O.’s latest release ‘Acro’ is out now and available to purchase from their bandcamp page. Musician and composer Matana Roberts offers a quick follow up to Chapter Two of her Coin Coin series with the release of ‘Coin Coin Chapter Three: River Run Thee’. The new album sees Roberts expanding upon the groundwork established with the first two Coin Coin albums, though this time incorporating a great number of new elements and ideas. Chapter Three offers much the same in terms of themes and concepts, though presented in a wholly different package. On her latest record, we see Roberts expanding out musically, showing us even more of her capabilities and talents, all of which result in another wonderful album experience. ‘Coin Coin Chapter Three: River Run Thee’ musically seems to depart from the more jazz-orientated previous chapters, instead opting for more ambient soundscapes to establish the tone of the album. Musically the album seems to depart from conventional genre classification, instead taking elements here and there of many genres to offer up a musically rich album experience. The many themes and ideas first presented on the previous two albums work their way into these new sounds being presented by Matana, offering us something that feels both new and continual of what’s already been established. Whilst elements of jazz music work their way into the various tracks, it seems ‘Coin Coin Chapter Three: River Run Thee’ isn’t dominated by the style so much, as opposed to the previous two efforts. Whilst this is very admirable in a way of showing us Matana expanding her musical boundaries, it does offer elements of unfamiliarity to fans of Matana’s jazz style. ‘Coin Coin Chapter Three: River Run Thee’ seems to offer a wholly new musical experience, which might be disappointing to some, though it works well for the album itself, showing that there’s much, much more to come from Roberts in the future. ‘Coin Coin Chapter Three: River Run Thee’ is certainly different in many ways, though the best kind of different. Roberts has wonderfully expanded on her project in brilliant style, working in new ideas and elements to push along the continuing story with wonderful freshness. With three chapters now presented of Roberts’ Coin Coin series, we can start to see the overlying themes and ideas, as well as some wonderful musical motifs that help string everything together. It feels as though Roberts has an incredibly clear vision of what she wants to present with these albums, and she’s certainly presenting each in many wonderful styles. Matana Robert’s latest album ‘Coin Coin Chapter Three: River Runs Thee’ is out now on Constellation Records. Following on from months and months of poor health, Canadian alternative rock band Siskiyou offer up their third studio album ‘Nervous’. The new album sees Colin Heubert taking influences from his poor health to offer up an incredible album experience, full of unsettling ideas and nervous emotions. ‘Nervous’ seems to depart from the warm and inviting sensibilities of Siskiyou’s previous albums, instead going for a much darker approach to the music. At times, it’s a little worrying, though the sheer power of the bands’ music in expressing these emotions so perfectly makes ‘Nervous’ a wonderful album experience, and arguably one of the best efforts thus far from the band. On ‘Nervous’, Siskiyou seem to stray off of the arguably folk-inclined roots of their first two efforts, in favour of a much more powerful and punchier alternative rock style. ‘Nervous’ builds up wonderfully with a great array of instruments and techniques, fully supporting the incredibly haunting hushed whispers of lead singer Colin Heubert, whose vocal style dominates the record with careful uncertainty. Everything seems very meticulously planned, with every last detail working to push forward the overall tone and emotion of the album itself. It’s a wonderful effort from Siskiyou who seem to have propelled themselves forward within their genre. Fans of Siskiyou might find the departure from the more gentle style of the first two albums to be somewhat disappointing. ‘Nervous’ is a warm and inviting album, but rather one that exercises caution with each of its songs. There are some familiar notes of the warmth we know from the band, though the album isn’t dominated by the tone. The departure might be a little bit much for fans of the first two efforts, but its easy to see the sheer amount of talent going into this record, which exudes brilliance at each and every corner. It’s dark, it’s worrying and it’s different but it’s dark, worrying and different for all of the right reasons. Siskiyou seem to have outdone themselves on their latest record, pushing something forth that they can truly be proud of. ‘Nervous’ seems to outshine every other effort from the band, without actually demeaning the bands’ first efforts. ‘Nervous’ just works incredibly well as an album experience, with overlying arches in all the tracks cementing them all together, presenting a vision that Heubert wants to share. It’s a wonderful album effort that certainly makes Siskiyou a band worth taking note of. Siskiyou’s third studio album ‘Nervous’ is out now on Constellation Records. 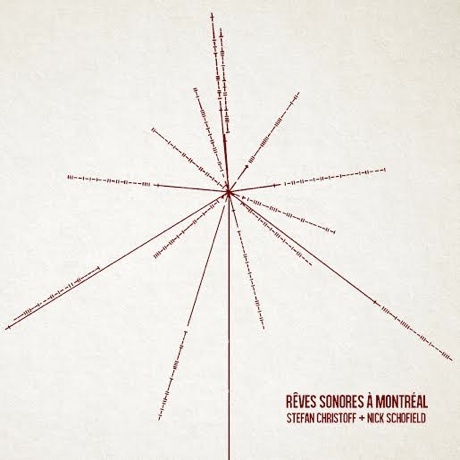 Musicians Stefan Christoff & David Parker team up for the release of ‘Wire Tones EP’, a short recording inspired by concerns over expansions of prison complexes in Canada. This rather short recording offers up semi-improvised music, featuring Christoff on piano and Parker on contrebasse. The recording sees the musicians utilizing samples to great effect, with the main focal point of the EP’s second track being an incredibly passionate speech by Kim Pate from the Canadian Association of Elizabeth Fry Societies. ‘Wire Tones EP’ showcases the wonderful musical talents of both artists, as well as their ability to present incredibly passionate music about issues that are incredibly important to them. 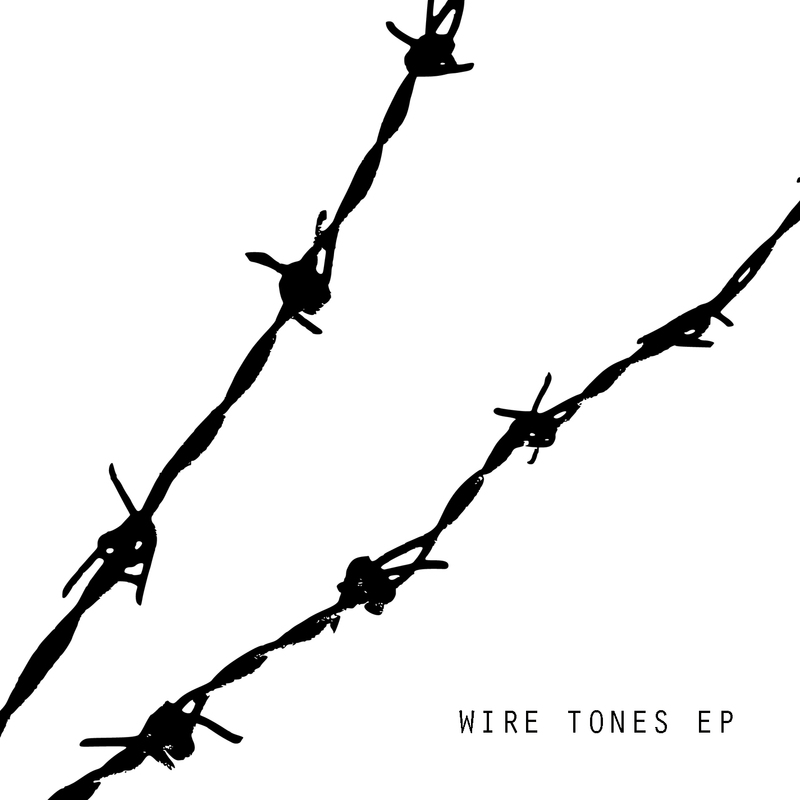 ‘Wire Tones EP’ seems to expand upon previous ideas and concepts we’ve seen before by Christoff, mostly in how the music offers up a gentle and relaxing tonal soundscape, backed up by a strong political message. Both Christoff and Parker contribute wonderfully to their shared vision on the EP, both utilizing their respective talents in very strong ways. Unlike previous releases by Christoff, where political ideas and notions are presented purely through instrumental music, ‘Wire Tones EP’ utilizes a sample from Kim Pate to help push forward the political message behind the EP. The sample works incredibly well alongside the wonderful music by Christoff and Parker, helping us as listeners to gain a greater understanding of the worries being felt by these artists. It’s arguable that the choice to use samples, instead of relying purely on the instrumental music, perhaps hurts the EP’s appeal, though the choice do to so seems to work incredibly well. Christoff & Parker’s ‘Wire Tones EP’ is perhaps a little unconventional in some areas, though it works wonderfully as a great expression of talent, and an expression of important issues. It’s easy to see that the main issue being pushed forward by Christoff & Parker is an issue that means something to the both of them, which comes across well on the EP itself. ‘Wire Tones’ is incredibly short in some respects, though it offers up a lovely musical journey, and one that is also rather thought provoking. Stefan Christoff & David Parker’s latest release ‘Wire Tones EP’ is out now and available through Howl! Arts Records. Following on from producing and conducting the scores for Christopher Nolan’s previous films (The Dark Knight, Inception, The Dark Knight Rises), Zimmer returns with his latest soundtrack for Nolan’s latest film ‘Interstellar’. The soundtrack album for the film sees Zimmer employing some new ideas and techniques, resulting in a soundtrack experience that perfectly encompasses the film it was composed for. Whilst some soundtrack albums might come across poorly when listened to independently from their accompanying films, it seems Zimmer’s managed to produce a wonderful album experience that is easily enjoyable as a stand-alone album experience, as well as one that works perfectly for its film. The strengths of Zimmer’s score seems to be in his minute and delicate touch in each of the tracks. There’s a wonderful timbre to the music as it slowly sets the scene up, before manipulating emotions through its sound and pace. At times, the score seems minimalist, using small minute instruments and techniques to set the scene, before building up into incredible and emotional movements. Driving forces in the tracks seem to be the motif of ticking clocks, which play a huge part in how the music guides itself, and how it presents itself as a musical piece. It’s all perhaps one of Zimmer’s most impressive soundtracks, and one that is incredibly enjoyable as an album experience. Although Zimmer’s score works incredibly well as an album experience separated from the accompanying film, it seems that it makes much more sense in context of the film. One who has seen the film will more than likely find the separate movements of the soundtrack to be an incredible listening experience, and one that brings back the majesty of the film itself. One who listens to the soundtrack without having seen the film might find it all to be rather enjoyable, as it is a very strong album experience, though the real context would be completely lost. ‘Interstellar: Original Motion Picture Soundtrack’ is perhaps one of Zimmer’s best pieces of work to date, perhaps even outshining the now significant soundtrack of ‘Inception’, whose musical motifs seem to have become a standard in modern Hollywood movies. Zimmer seems to have taken more of a step back in his compositions, relishing much more in a subtle approach to the music, rather than going for the big and dramatic. (not to say that music on this particular soundtrack isn’t dramatic!). This is perhaps a good example of a perfect soundtrack where every single element comes together cohesively in an incredibly strong way, working well to support both great music and great film. Hans Zimmer’s latest album ‘Interstellar: Original Motion Picture Soundtrack’ is out now. Ambient musician Matthew Robert Cooper, better known as Eluvium, offers up the very welcome digital release of his 2014 EP ‘Pedals/Petals’. 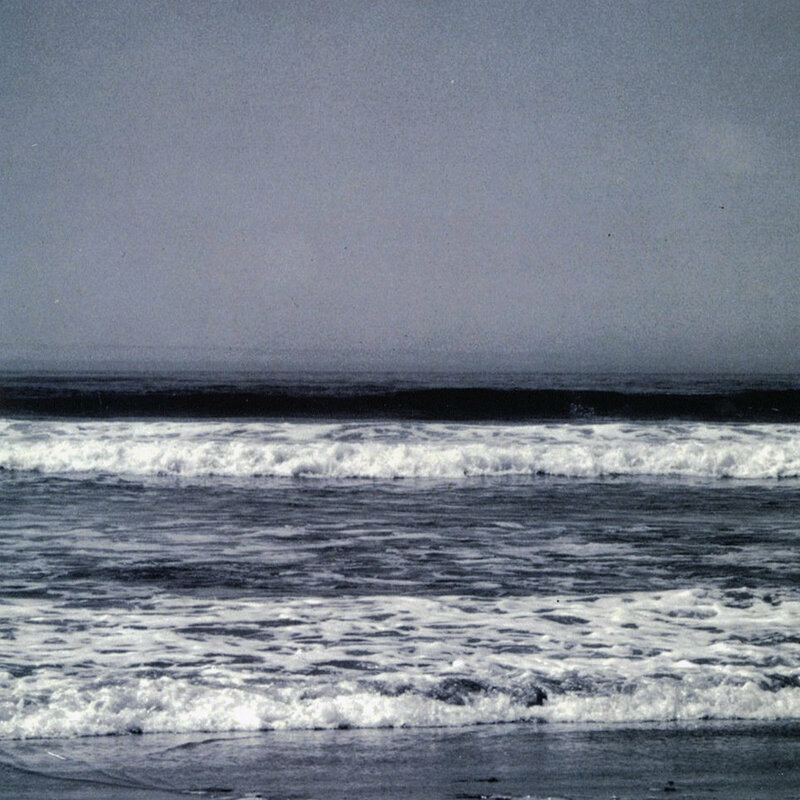 The originally vinyl-only release saw Cooper offering two ambient tracks roughly 10 minutes each in length, both featuring his now trademark ambient style. Although rather short, ‘Pedals/Petals’ offers up a very nice and inviting ambient musical experience, perfect for playing and letting wash over one’s self. Although the EP might not demonstrate any new techniques or ideas from Cooper, it does present what the musician does best, and in a very enjoyable way. ‘Pedals/Petals’ opens up in typical Eluvium fashion, by introducing a wave of electronic drone that is accompanied by ambient movements that swirl around like waves. There’s a wonderful driving force in both of the tracks, which offers up a very relaxing ambient experience, but one that also rewards attentive listening. Both tracks seem to follow similar forms and ideas, both constructed around similar notions, though they also seem to offer something different to each other, though in very subtle ways. The main elements at play here on ‘Pedals/Petals’ might not deviate all that much from most of Cooper’s other releases, and in fact sounds like a shorter and arguably more accessible version of ‘Catalin’, though there’s something lovely and enjoyable here still being offered. Some might not find ‘Pedals/Petals’ to be all that impressive, though this rather brief record is certainly a reminder of the great amount of talent from Cooper. The ambient notions being offered on the two tracks feel almost effortless in their creation, though showcase the wonderful and complex style of Cooper in wonderful fashion. The way in which the ambient techniques wash over so wonderfully make this short EP a wonderful listening experience, and one that fits alongside nicely amongst everything else Cooper has released thus far. Eluvium’s latest EP ‘Pedals/Petals’ is available on Vinyl and on digital download on Bandcamp. 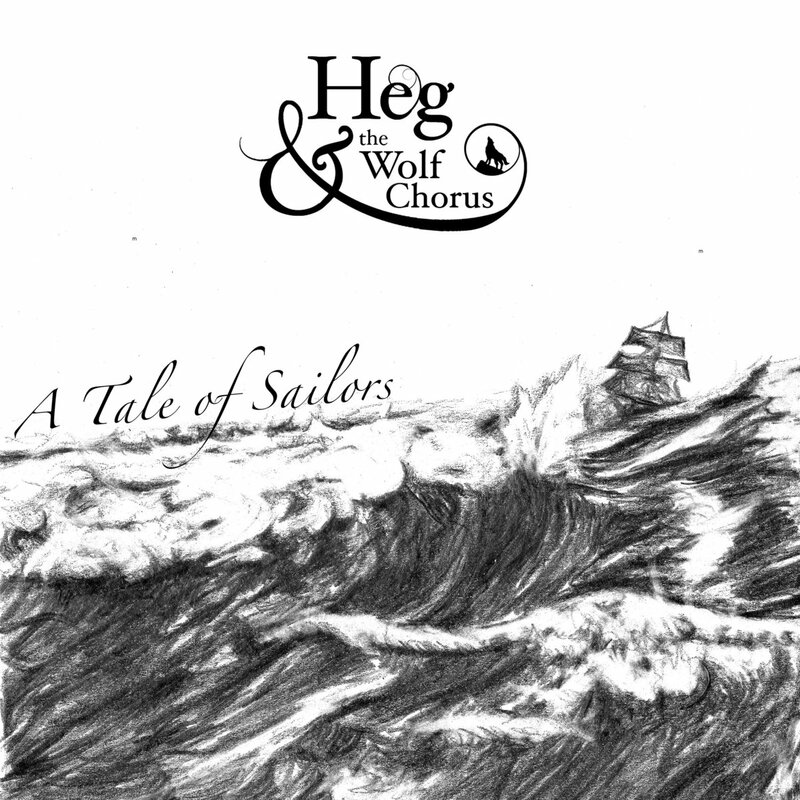 Alternative folk band Heg & The Wolf offer up their latest EP ‘A Tale Of Sailors’. The new EP encompasses everything the band is striving for, presenting their version of the folk genre in a somewhat enjoyable fashion, featuring rather strong vocals and some nice ideas here and there. Heg & The Wolf have some very strong talent when it comes to their own branch of folk music, and whilst it’s certainly appealing to some on some levels, it seems that the band has fallen horribly short in their complete lack of invention within the genre. Heg & The Wolf’s latest EP offers up a quintessential folk experience, where flowery vocals are accompanied by fiddles and acoustics. The tracks on the EP are rather nice for the most part, and at the very least demonstrate a good understanding of the genre, as well as its forms and conventions. It seems though that there’s just not enough life in the music itself. Heg & The Wolf seem to just do what is expected of them, rather than create something genuinely interesting. The bare elements of the tracks, them being the instrumentals, choice of instruments, singing style and even the lyrics are all elements we’ve heard before. Nothing really seems to separate Heg & The Wolf from the sea of everything else they’re trying to be a part of. ‘A Tale Of Sailors’ demonstrates good understanding of genre, but nothing really stands out on this EP, making it a rather dull and drab listening experience. There doesn’t seem to be any real unique element in any track, and nothing that suggests there’ll be some to come at any point in the future. Perhaps Heg & The Wolf will surprise us at some point in the future, but if this latest EP effort is anything to go by, then I won’t be holding my breath. Heg & The Wolf’s latest EP ‘A Tale Of Sailors’ is out now. English rockers from Newcastle Upon Tyne Bernaccia offer up their latest musical effort ‘Light//-//Dark’. The new EP comprises four new tracks from the band, showcasing a strong and remarkably fun style of indie-rock music, featuring a few elements here and there of progressive rock and even hints of blues. 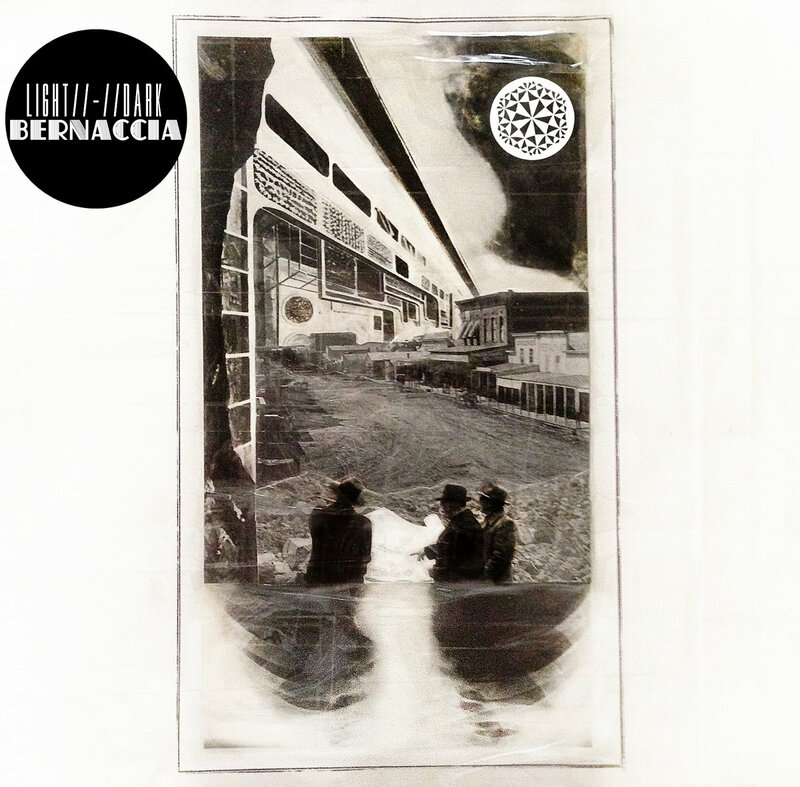 Bernaccia showcase on their latest EP an enjoyable and strong style of indie-rock music, suggesting the same kind of appeal that is given off by The Afghan Whigs, though ultimately within their own style. ‘Light//-//Dark’ is a rather short listening experience, though one that showcases brilliantly everything the band have on offer. Bernaccia present a very enjoyable rock style on their latest recording, one that seems to just get many of the elements right, resulting in tracks that feel fresh and enjoyable in their own right. There’s a wonderful driving force in each of the four songs, pushing everything along brilliantly in a way that’s hard to not rock your head too. There’s something almost indulgent and brilliant about the style of indie-rock Bernaccia present, which seems to work on most levels. Whilst there’s much Bernaccia do right on their latest EP release, it does sometimes feel that the band are perhaps capable of a little bit more than what their music is suggesting. Many elements come together nicely, but it feels as though Bernaccia as a band could be utilizing the indie-rock genre with their own talents much more than they seem to be doing at the moment. ‘Light//-//Dark’ is an enjoyable EP in its own right, showcasing the strengths of the band nicely, as well as most of their capabilities as a band working in this genre. At the moment it seems to be a good precursor to what more their is to come, showing off nicely what they can do, but perhaps holding back on some ideas until they release a full-album at some point in future. At the moment though, it’s not too hard to see the appeal of a band like this, who offer up a nice alternative to other bands working in the genre. Bernaccia’s latest EP ‘Light//-//Dark’ is out now.